Here are the eats to look forward to. Oh, how we love spring. It’s that time of the year when the world starts to wake up from winter slumber, the trees come alive and the people suddenly become seemingly a lot happier. Even in perpetually sunny Singapore, chefs make the habit of changing up their menus according to the season and available produce. Here are the dishes we’re craving for now. The restaurant isn’t just a destination with a view, it’s also got a delectable menu to boot. Drop by and savour chef Fernando Arevalo’s spring menu inspired by the rich Mediterranean flavours. There are tons of options such as the braised wagyu beef cheeks embellished with leeks, snow peas and beetroot dumplings, which easily snaps between the teeth, or the Japanese hamachi, slightly nutty with the arugula rub and accented with peppery artichoke poivrade, tangy pickled ramps and crispy duck. Vegetarians are more than welcome, thanks to an array of options crafted with the season’s premium ingredients. We’re fans of the homemade ravioli bursting with veggie and cheese filling and the beetroot gnocchi. Focus on the quality, not quantity. That seems to be Morton’s of Chicago’s motto when crafting their seasonal menus. There are five variants that showcase top-notch steaks like the lightly seasoned wagyu filet, cooked to your desired doneness and accompanied by herbed tallow butter, a tender and juicy prime dry aged bone-in strip steak. To make you feel less guilty, there are salads and fish to go with your mains. Must-tries include the burrata with mango and tomato salad, and the seared halibut with the pesto-like herb pistou. Inspired by his travels around Asia, the nomadic chef combines classics (king crab menu and wagyu sliders) and new creations to create a lipsmacking seasonal menu. “We want to give our guests a little taste of our memorable experiences, where we enjoyed the best food of our lives,” he shares. Take, for example, the sugar cane skewers with a savoury nuoc cham sauce he created from his time in Bangkok, and the homemade tofu with soy, walnuts, ginger and chicharon, which melds the Japanese and Filipino cuisines. Other than new dishes, he added new sections to the menu—from the robatayaki grill which churns out delicious, aromatic skewers to vegetable sides and meat and seafood offerings. 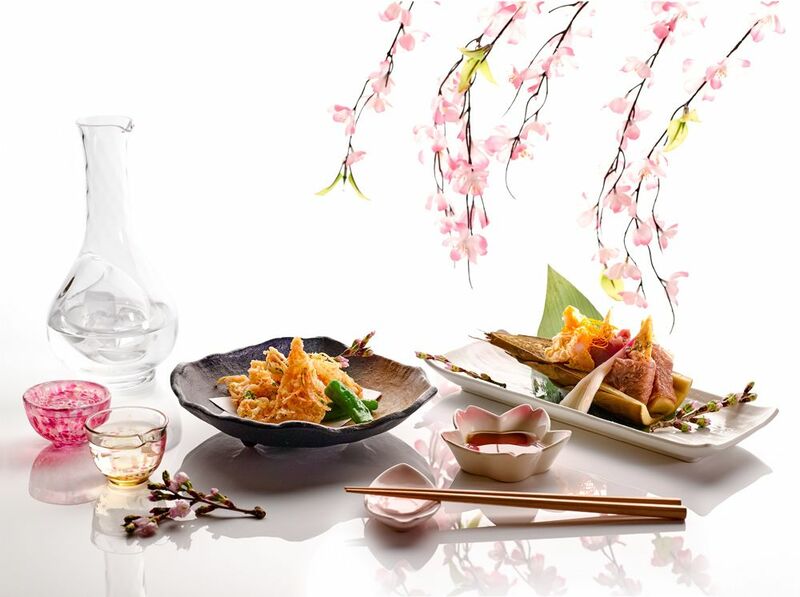 Spring in Japan is in full bloom, and the chefs at Keyaki have truly been inspired in their nine-course kaiseki menu. Try the takenoko (bamboo shoots) which are grilled with prawn and coated with raw egg yolk; hotaru ika (firefly squid) which are boiled and topped with miso; and the katsuo (bonito) served as ornaments to the glistening tuna belly sashimi. Pastry chef Eddy Yau has also debuted his utterly addictive matcha souffle, known for its moistness and light, fluffy texture. Singapore’s most fashionable chef, Kenjiro Hatch Hashida, pays tribute to spring with two seasonal seafood dishes in the omakase menu. Take a seat at the chef’s table and revel in how he marries the saltiness of the Hokkigai (Japanese surf clams) with the sweetness of the Tarabagani (King crab) to craft this highly addictive starter. After a couple of small bites on the menu, he ends the meal with the too-pretty-to-eat, sweet and savoury dessert of tai no domyoji mushi, or mochi rice with seabream filling and cherry leaf topping.